Congratulations to Ronald P., Winner of the 4th Annual Birth Trauma, Neonatal Injury, and Disability Scholarship! 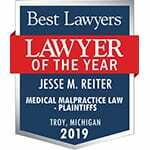 We at Reiter & Walsh P.C. are happy to announce that Ronald P. of Azusa, California is the winner of our 2018 Birth Trauma, Neonatal Injury, and Disability Scholarship! Ronald himself was a victim of a birth injury when he and his twin brother were born prematurely at 26 weeks. Due to an issue with their umbilical cords, the twins experienced asphyxia. In his essay, Ronald reflects on how his birth injury impacted his life. Because the doctor was unable to catch and prevent oxygen deprivation in time, Ronald later experienced developmental delays and autistic symptoms. In his essay, he speaks of how he used being bullied in school for his autistic symptoms and obesity. He tells of how these experiences pushed him to really start living. With help from his friend Nehemiah, he changed his lifestyle, diet, and began exercising, eventually losing 100 pounds. Members of his church noticed his physical and social transformation and were inspired to better themselves as well. Ronald created a Fitness Association in order to help people going through a similar journey to himself. He ended up helping hundreds of people improve their health habits, which inspired him to go to school to become an advanced practice nurse to become a health advocate for patients. Ronald is a graduate student studying at Azusa Pacific University. He is studying to become a psychiatric nurse practitioner, as well as an anesthesia provider for those experiencing birth complications. Through his rotations and clinical experiences at school, Ronald has provided obstetric anesthesia to mothers in need, and comforted mothers during the birthing process. Check out the 2019 scholarship application, here!